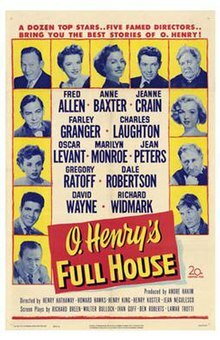 O. Henry's Full House is a 1952 American anthology film made by 20th Century Fox, consisting of five separate stories by O. Henry. The film was produced by André Hakim and directed by five separate directors from five separate screenplays. The music score was composed by Alfred Newman. The film is narrated by author John Steinbeck, who made a rare on-camera appearance to introduce each story. Directed by Henry Koster, from a screenplay by Lamar Trotti, it stars Charles Laughton, Marilyn Monroe and David Wayne. Directed by Henry Hathaway, from a screenplay by Richard L. Breen, it stars Dale Robertson and Richard Widmark. Plot: A detective cannot arrest a murderer he knows from his past due to his honor involving an outstanding financial debt to the criminal. Once a newspaper offers a reward, after being mocked by the criminal, the detective arrests the criminal and collects the reward to repay the debt. Directed by Jean Negulesco, from a screenplay by Ivan Goff and Ben Roberts, it stars Anne Baxter, Jean Peters, and Gregory Ratoff. The story is set in Greenwich Village during a pneumonia epidemic. An old artist saves the life of a young artist, dying of pneumonia, by giving her the will to live. She can see an ivy plant through the window gradually losing its leaves, and has taken it into her head that she will die when the last leaf falls. Seemingly, it never does fall, and she survives. In reality the vine lost all its leaves. What she thought she saw was in actuality a leaf, painted on the wall with perfect realism, by the old artist. The old artist dies of a heart attack while being out in the wet and cold, painting the last leaf. Directed by Howard Hawks, from a screenplay by Ben Hecht, Nunnally Johnson and Charles Lederer, it stars Fred Allen, Oscar Levant and Lee Aaker. Directed by Henry King, from a screenplay by Walter Bullock, it stars Jeanne Crain and Farley Granger.